From the 15th minute until after the 70th minute Sunday afternoon, there was one dominant team on the pitch at Complexe Sportif Claude-Robillard in Montreal. It was the Bethlehem Steel. But as we know, the visitors allowed two goals after the 80th minute and surrendered their 2-1 lead, falling to the USL team with the most losses. Now 5-18-1, the win means FC Montreal leapfrogged Pittsburgh and are finally out of last place. It’s worth looking at why Bethlehem lost, because it illustrates a bit about the team. Many contributing causes for the loss come to mind as frustration and disappointment recede, allowing rationality to raise a number of troubling questions. Was defensive midfielder Bolu Akinyode once again absent due to paperwork issues involved in crossing the Candian border? Might the same thing have happened to 16-year-old central midfield substitute Anthony Fontana? Is Anderson better suited to a defensive central midfield role than center back in the USL (and potentially MLS)? Would Eric Ayuk have tracked back on his mark, who scored the 90th minute winner, if he had not spent more than two months in Africa, playing a different system with younger practice mates? And why did Taylor Washington forget the back post on the equalizer? Was Steel naïve to keep trying for the clinching third goal in the last 10 minutes instead of protecting their lead? Is the Montreal organization’s complete commitment to youth development a superior long-term strategy to the Union’s focus on player development, because the lesser emphasis on the Impact’s needs allows greater continuity and – (finally!) – success, than does the on-going discontinuity of the Steel’s 23 different line-ups in 24 games? Others will augment this list. The game was lost because Montreal bench changed the flow of the game, and Steel’s attempts to counter with fresh legs were insufficient. Hindsight is both cruel and unfair, and we all know Monday morning quarterbacks don’t play in Sunday’s split-second environments. Why were only two sets of fresh legs sent on for Steel and not the full five subs allowed? Why was the last sub held out until the 86th minute, when the wet, muddy field’s effects on legs were obvious after 70 minutes? Perhaps the most important questions focus on what the Steel needed on the game day bench versus what they actually had. 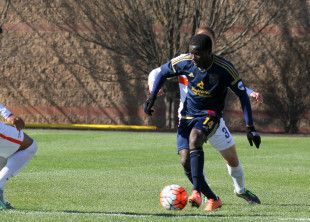 Derrick Jones is a 19-year-old playing at the end of his first professional season who has just moved up to the Union. In recent games, Anthony Fontana has subbed for him around the 75th minute. Why was there no Fontana this weekend? Leo Fernandes’s legs were carrying concrete blocks on them in the waning moments, which is not surprising for a Union bench player who has been taken off late in games before. Jamie Luchini was present, but Justin McMaster went on instead. Was Luchini hurt and held off because of the wet conditions? And what about Fred? Could Nick Bibbs have come on for Chambers at the No. 6, with Chambers moving up to relieve either Jones or Fernandes? Has the combination ever been tested in practice? The bench held no useful substitutions for the three central midfield players aside from 37-year old Fred, whose effectiveness has declined as this season’s pace of play has accelerated. Recently, either Corey Burke has started at striker and Seku Conneh has replaced him after the 60th minute, or alternatively, Conneh starts and Burke subs on after an hour. There is no question that starting Burke contributed to Steel’s best run of success. He scored the go-ahead goal this weekend, and he hunts opposition fullbacks on defense like they were deer in the mountains after Thanksgiving. There is also no question the young Liberian lacked the Jamaican’s effect on defense. Who knows what Burke back in the box might have meant in the 80th. Perhaps Washington would have been more likely to remember the back post instead of staying central. The Union Academy program has turned over for its new year at exactly the wrong time for Steel, at the start of the USL season’s home stretch. Ayuk was legitimately gassed Sunday. No Steel fan who saw the game will question his value, effectiveness, or effort. The Montreal defender who tried to mark Ayuk all game scored the winner on a stoppage time run with the Steel man trailing five yards behind. However, all the Academy flank midfielders who have dressed in the past and might have replaced the Cameroonian are off to college. Too often the Steel has not had what they have needed on the bench this season. The roster has simply been too small. If the organization’s front office expects fans to take the Steel seriously, they need a USL safety net ready for times when the Union Academy and first team cannot not step up. The name of a second goalkeeper appeared Sunday evening on the Steel’s roster page of the USL website: “Mathew Perrella, GK, NJ Copa FC, United States.” Curiously, Matt Perrella was the goalie the Carolina Railhawks signed to a short-term loan in May of 2015 when they loaned Brian Sylvestre to Philadelphia Union. Perrella’s apparent addition to Steel may be a first step in the right direction. Wet Muddy fields take extra out of the legs. The Steel began to show the effects after the seventieth minute. That’s when the Montreal subs began and the game began to turn. That’s when the lack of countering fresh legs began to really hurt them. Corey Burke will miss the Red Bulls home game on September 4th. Unless he reports a day late to Jamaican National Team camp, he will also miss the August 30th game at Harrisburg. Steel did not announce the signing of Perrella so I do not think it is a actual signing. It’s probably just an emergency basis like the Union did with Trey Mitchell.